When Dr. Dan’s son Spencer was 11, he suffered from a baseball injury resulting in patellar tendonitis. He was limping and unable to walk. Looking for laser therapy to help Spencer heal, Dr. Dan was counseled to use the same laser therapy professional athletic teams use. His son’s recovery was unbelievably fast! The results inspired Dr. Dan to use the technique on his own shoulder, and he felt significant relief. During a trial period at the office, patients experienced greater healing and satisfaction. This confirmed Dr. Dan’s decision to bring in this effective technology to share with patients like you. This powerful, 9w cold laser is not normally found clinically, but rather is used for professional sports teams. With the undeniable results, Dr. Dan is pleased to be able to offer you this quality cold laser therapy here at Joseph Health Group. 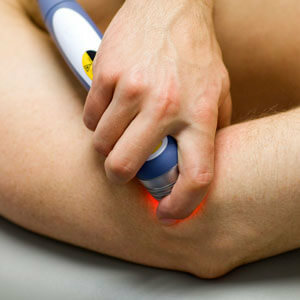 Laser Therapy is clinically proven as an effective treatment for pain and inflammation. Able to penetrate to deep tissue structures, it has the ability to treat a wide variety of both acute and chronic conditions including low back pain, hip bursitis and chronic neck pain. Deep tissue conditions are treated exceptionally well using the LightForce™ Therapy Laser’s patented Laser-Massage® treatment head. This patented feature allows the practitioner to deliver energy while manipulating underlying tissue and muscle thus enhancing the effectiveness of the treatment. The noninvasive nature of Deep Tissue Laser Therapy provides a solution for those who are looking for alternatives to prescription drugs and surgery. Patients feel a soothing warmth as laser energy gently penetrates tissue and boosts your body’s regeneration powers to relieve your pain. Treatments are painless and fast (5 to 10 minutes). Results can be immediate, but the most observed results are after 3 to 5 treatment sessions. The body continues to benefit from the effects of the therapy for 18-24 hours after treatment. During this time, modulated cellular activity leads to decreased pain and inflammation. Would you like to experience the benefits of laser therapy? Contact us today for an introductory evaluation to determine if Deep Tissue Laser Therapy is right for you. Get back in action today with Dr. Dan and Deep Tissue Laser Therapy.